These are lyrics by Craig David that we think are kind of repetitive. Why repeat the word booty so much, let alone the whole lyric. The song is cool and all, but he says booty too much. When I say bo, Use Deodrant. 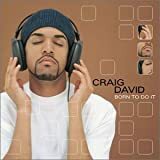 Craig David's, "What's Your Flava?" Tell me what's your flava?